On this date in 1906, prominent architect Stanford White was shot and killed at the rooftop theater of Madison Square Garden. The shooter was Harry Kendall Thaw, of Pittsburgh. Thaw, the heir to a multimillion dollar fortune, held a grudge against White, whom he blamed for thwarting his efforts to achieve the respect of high society. White was also the former lover of Thaw’s wife, Evelyn Nesbit. Nesbit had been a popular model and chorus girl and was the inspiration for the movie The Girl in the Red Velvet Swing. At trial, Thaw went with a temporary insanity defense (“temporary” probably being the only part that was exaggerated). The jury wound up deadlocked. 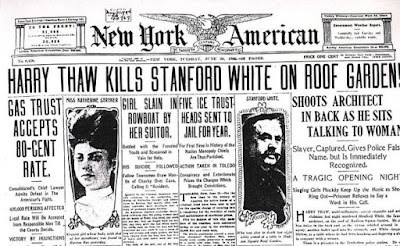 At the second trial, Evelyn Nesbit took the stand and testified that Stanford White had abused her and that Thaw was just acting in her defense. She performed this task in exchange for the promise of a divorce and a million dollars from Thaw. The jury found him not guilty by reason of insanity. Thaw received a sentence to the state mental hospital at Matteawan. Nesbit received her divorce, but not the money. Thaw escaped from Matteawan in 1913 and fled to Canada. He was eventually apprehended and extradited to New York. After receiving a new trial, he was found sane and not guilty of murder. He was released from state custody in 1915. Thaw was arrested again in 1916, this time for the abduction and sexual assault of 19 year old Frederick Gump (no relation to Forrest). He was found not guilty by reason of insanity (it’s like déjà vu all over again). In 1924, Thaw was judged sane and released from the asylum where he had been incarcerated. Harry Thaw died of a heart attack in Florida in 1947. In his will, he left Evelyn Nesbit ten thousand dollars, about one percent of his estimated net worth. Writer of fiction and true crime. He is the author of Under the Wall: The True Story of the 1945 Tunnel Escape from Eastern State Penitentiary and Over the Wall: The True Story of the 1947 Escape from Holmesburg Prison. He is an Army veteran and a retired Air National Guard Master Sergeant. He currently lives in Albany, NY where he works as an investigator.